Now that you've finally got your hands on a Raspberry Pi®, you're probably itching to make some fun embedded computer projects with it. 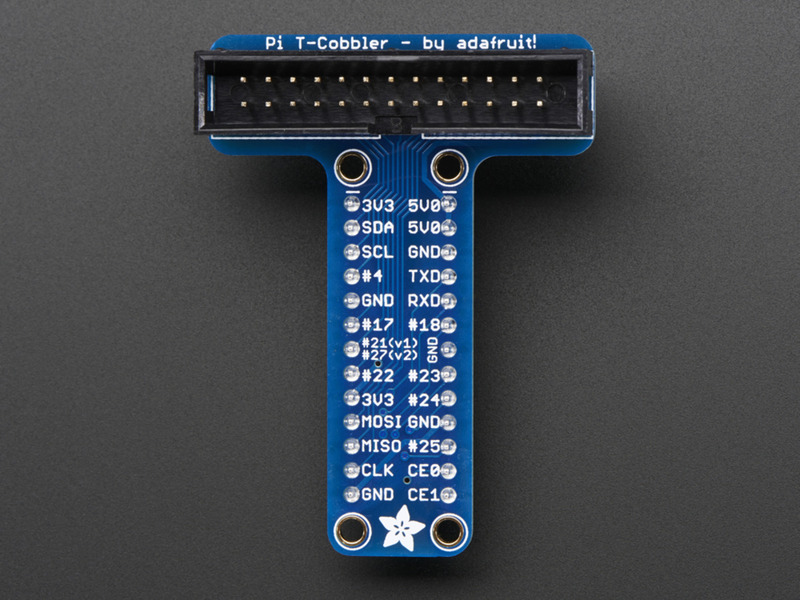 What you need is an assembled add on prototyping Pi T-Cobbler from Adafruit, which can break out all those tasty power, GPIO, I2C and SPI pins from the 26 pin header onto a solderless breadboard. This mini kit will make "cobbling together" prototypes with the Pi super easy. Designed for Raspberry Pi Model B Revision 1 or Revision 2. This assembled Cobbler is in a fancy T-shape, which is not as compact, but is a little easier to read the labels. We also have the more compact original Cobbler. 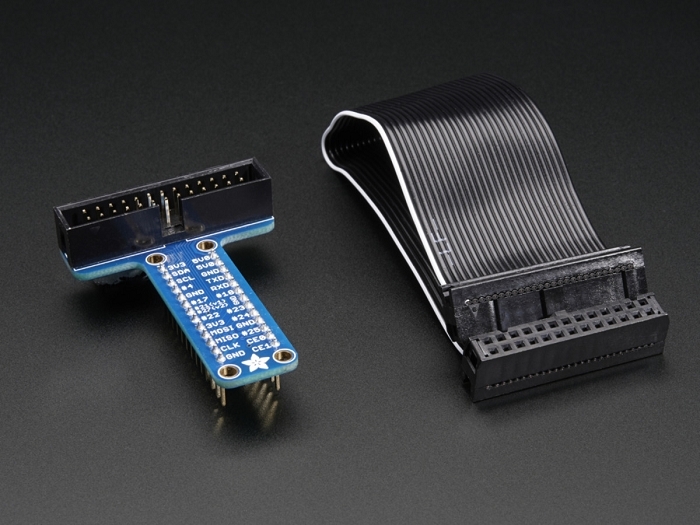 The assembled Pi T-Cobbler mini kit comes with a 26 pin ribbon cable, and an already soldered T-Cobbler as shown. No soldering required! This mini kit comes fully assembled! The PCB and header come soldered together so you can plug the cable between the Pi computer and the T-Cobbler breakout. 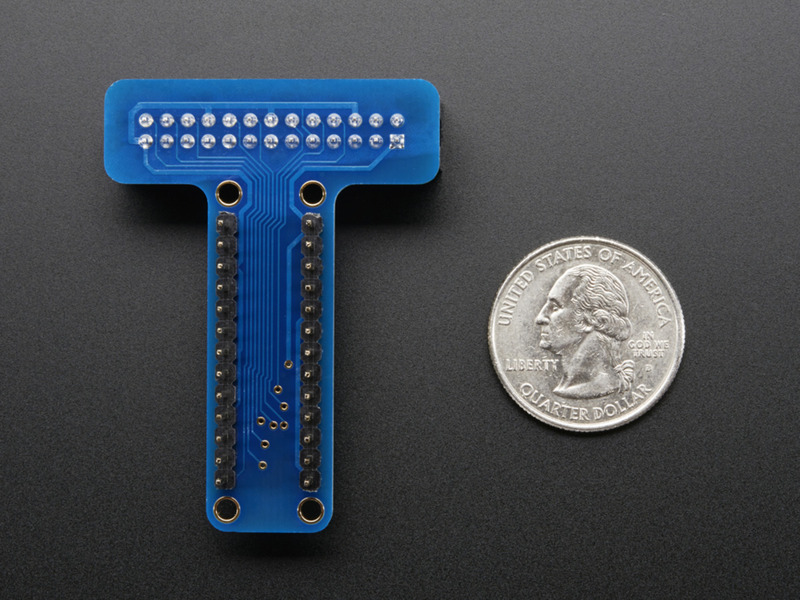 The T-Cobbler can plug into any solderless breadboard. The T-Cobbler PCB has all the pins labeled nicely so you can go forth and build circuits without keeping a pin-out printout at your desk. We think this will make it more fun to expand the Pi and build custom circuitry with it. Please note, this product only contains a 26 pin ribbon cable, a custom PCB with ribbon cable socket and header pins soldered to it. The Raspberry Pi, breadboard, breadboarding wires, cables, components, case, power supply, etc is not included! We do stock many of those items in the store, so check those out as well!